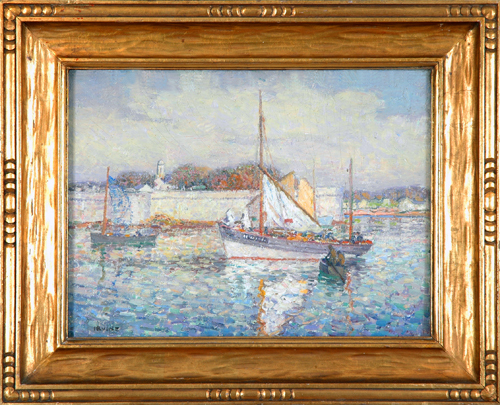 Born/lived: Byron, IL/ Lyme, CT.
Best known for: American Impressionist landscape painter. Studied: Art Institute of Chicago. Member: Associate National Academy; Lyme Art Assoc. ; Chicago Society of Artists; Chicago CC; Cliff Dwellers; Pallette and Chisel Club (founding member), Chicago; Salmagundi Club; Allied Art Assoc; National Arts Club; Chicago Arts Club; Society of Western Artists. Exhibited: Art Institute of Chicago; P-P Expo, San Fran; Chicago SA; CAFC; his experimental “aqua-prints,” Roullier G., Chicago, 1920s; jewel-like “prismatic paintings” first exhibited at Grand Central Art Gallery,1930; Lyme Art Association. Connecticut Academy of Fine Arts; Lyme Art Association. Work: Art Institute of Chicago; Municipal AL; Sears Mem Museum, Elgin, IL; NAC; Rockford Art Assoc; Ill; Phoenix Art Museum; Benton Museum of Art. Artist Last Name Irvine, A.N.A.